This is an awfully modern sounding interview with Bette Davis from 1963. Davis evidently had gender issues on her mind. She really let loose in this interview, which was done the year after she starred in "What Ever Happened to Baby Jane." Not only does she nail the coming alienation between many men and women, she also nails the entire sexual revolution - which did not become a popular topic in the general media for another decade. One can point out that Davis may not have been feeling particularly happy around the time of this interview. Despite her acclaimed performance in "Jane," she was reduced (there's no other way to put it for a huge star of yesteryear like her) to appearing on television series in 1963 such as "Perry Mason" and "The Virginian." Back then, television was the province of has-beens and never-weres. The roles were still there for Davis, but they weren't coming along as often as they used to, a point she seems to be alluding to at various points of this interview. One can also see this as evidence that some things never change. People who are unhappy about things are nothing new, and issues of gender are always there if that is your focus. They were there 50 years ago, and they will be around 50 years hence. This animation of the interview is another in the series from Blank on Blank (a production of the Brooklyn-based, nonprofit Quoted studio), produced in collaboration with PBS digital studios. The interview is by Detroit's reigning celebrity journalist, Shirley Eder. Bette Davis naturally had all sorts of insightful comments about the general attitudes towards women. "As a female, I think (intelligence) is a terrible hindrance in business. I think it's a terrible hindrance for any female to have a lot of intelligence in private life. But I think in business it's sometimes even worse because there's deep resentment, no question about it, from the male side of the business," said Davis, a two-time Oscar winner with a habit of saying what she really thought. At one point, the film idol went on to say, "I think men have got to change an awful lot. I think somehow they still prefer the little woman. They're just staying way, way behind." To be fair, she adds that many women also liked that state of affairs. The actress's frank quotes have been getting attention from national media sites like Vanity Fair, Elle and the Washington Post. But the elegant, visually inventive video puts Eder in the spotlight, too. The attitude-laced Jezebel site even described her as a "badass columnist/reporter." The video, like others in the series, is made by executive producer and Blank on Blank creator David Gerlach with animator-director Patrick Smith and audio producer Amy Drozdowska. The Bette Davis interview was fascinating fodder on two levels. According to Gerlach, "Though I first was intrigued simply because it was this legend, Bette Davis, on tape, and no one had heard it in decades, the piece came together as these issues of women in Hollywood and gender roles in America flowed throughout the interview." 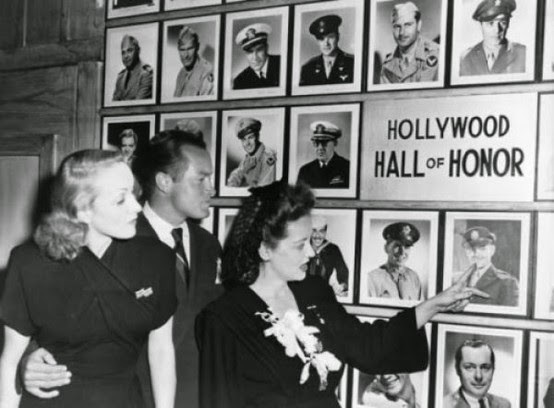 Bette Davis with Bob Hope and Marlene Dietrich. I'm not 100% sure, but she appears to be pointing to a picture of Clark Gable. Also, the picture just to the left of Gable's might just be Ronald Reagn, but I'm less sure of that. I'm sure about Gable, though. "I think men have got to change an awful lot"